Some of the world's biggest banks have revealed they are victims of an alleged fraud which has lost $50bn (£33bn). Bernard Madoff, who was arrested on Thursday, has been charged with fraud in what is being described as one of the biggest-ever such cases. Among the banks that have been hit are Britain's HSBC and RBS, Spain's Santander and France's BNP Paribas. Other victims include film director Stephen Spielberg's Wunderkinder Foundation charity. One of the City's best-known fund managers has criticised US regulators for not detecting the alleged fraud. Nicola Horlick, boss of Bramdean investments, told the BBC: "I think now it is very difficult for people to invest in things that are meant to be regulated in America, because they have fallen down on the job." "This is the biggest financial scandal, probably in the history of the markets - $50bn is a huge amount of money," she said. Banks and financial institutions across the world had investments with Bernard Madoff, but not all have yet confirmed what their potential losses might be. Among the potential losers is Spain's largest bank, Santander, which owns the UK High Street banks Abbey, Alliance & Leicester and Bradford & Bingley. Britain's HSBC said it had investments of about $1bn, which could be affected. Royal Bank of Scotland said it could potentially lose about £400m ($601m) if all its investments had to be written off. The French bank, Natixis, a subsidiary of Caisse d'Epargne and Banque Populaire, said it could potentially lose up to 450m euros (£402m; $605m). One of the world's biggest investment groups, Man, said it had invested about $360m through its RMF institutional fund of funds business, representing 0.5% of its total funds. Banking shares fell around the world, with Royal Bank of Scotland dropping 3.7%, HSBC losing 1.2% and banks making up the top four losers on New York's Dow Jones Industrial Average. Meanwhile, some of the biggest private losers seem to have been members of the Palm Beach country club, where many of Mr Madoff's wealthy clients were recruited. According to some reports, the list of prominent victims include a New Jersey Senator, the owners of the New York Mets and the charities run by film director Stephen Spielberg and Nobel Prize winning writer Elie Wiesel. Mrs Horlick said 9% of Bramdean's own funds were invested with Mr Madoff, but that even if the money was written off, the fund involved would be down just 4%. "I just want to make it clear to investors that even after this, they would have done extremely well, relative to anything else they could have invested in," she said. In a statement, Bramdean said: "The allegations made appear to point to a systemic failure of the regulatory and securities markets regime in the US." However, some argued that the fund managers should themselves have done more. "City figures cannot call for light touch regulation yet at the same time complain that regulators missed risks that the industry failed to spot," said Simon Morris, a partner with City law firm CMS Cameron McKenna. "It's the unequivocal job of the fund manager to check out the bona fides of whoever they chose to pass their customers' money onto," he said. Antonio Borges, chairman of the Hedge Fund Standards Board, said the scandal highlighted the need for "robust governance practices and oversight via independent boards, which will challenge management procedures and behaviour". Meanwhile one of the City's watchdogs, the Serious Fraud Office (SFO) called on whistleblowers to come forward with evidence of corporate wrongdoing in the wake of the credit crunch. The Serious Fraud Office said it wanted workers, former staff and shareholders to step up with information over suspected fraud in the current financial turmoil. Director Richard Alderman said: "Our objective is to ensure that we can bring offenders to justice as quickly as possible." US prosecutors say Mr Madoff, a former head of the Nasdaq stock market, masterminded a fraud of massive proportions through his hedge fund and investment advisory business. Mr Madoff is alleged to have used money from new investors to pay off existing investors in the fund. A federal judge has appointed a receiver to oversee Mr Madoff firm's assets and customer accounts, while the 70-year-old banker has been released on $10m bail. 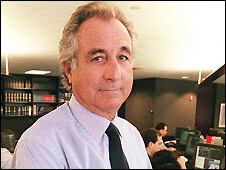 Mr Madoff founded Bernard L Madoff Investment Securities in 1960, but also ran a separate hedge fund business. According to the US Attorney's criminal complaint filed in court, Mr Madoff told at least three employees on Wednesday that the hedge fund business - which served up to 25 clients and had $17.1bn under management - was a fraud and had been insolvent for years. He said he was "finished", that he had "absolutely nothing" and "it's all just one big lie", and that it was "basically, a giant Ponzi scheme", the complaint said. If found guilty, US prosecutors say he could face up to 20 years in prison and a fine of up to $5m.